I grew up thinking that carob was something hippies ate because chocolate was a commercial product controlled by “the man.” Ok, ok, I thought that until the beginning of last week. Then I visited Israel to research a new book project, and I learned a thing or two about carob. Carob doesn’t grow where I live or forage, although you can find it in the U.S. in USDA hardiness zones 9 – 11 (sometimes in zone 8, with protection). It’s native to the Mediterranean, is quite drought tolerant, and grows best in full sun. Carob trees are dioecious and only the females bear fruit, so if you want to grow them (oh how I wish I could! ), make sure you have at least one male for every few female trees. You may see it described as an evergreen tree, but it loses most of its leaves in winter, especially in the northern part of its range. Carob pods are the fruits of the carob tree, and they look like large beans, which is exactly what they are. (Carob is a legume.) Pods are ripe when they turn from green to a dark, reddish brown. You can pick them from the tree (or shake a branch to dislodge them), but the easiest way to harvest carob is to gather them from the ground once they’ve ripened and fallen. Be sure to check fallen pods for insects and mold. In the batch I processed last week I found very little damage: one pod out of at least fifty. And those pods had been on the ground for at least three – four months. Carob pulp is sweet, and while the flavor and color are reminiscent of chocolate, you’ll be disappointed if you expect carob to be a chocolate substitute. 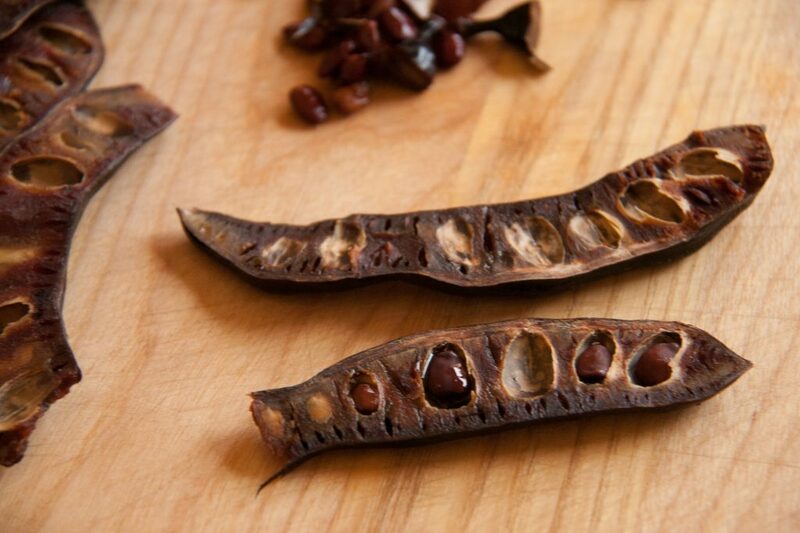 Carob has its own wonderful flavor: warm, and softly spicy. If you harvest straight from the tree, try chewing on a raw pod…it’s a great trail snack. Just don’t chomp down on a seed! They’re super hard and don’t have the same, sweet flavor. Older pods can be quite tough, making them less suitable for a casual chew. But they’re just as good for making carob powder. I’ve just begun to play around with this Mediterranean flavor, and I’m looking forward to more recipe research. So far my favorites are carob horchata (and the adult, cocktail version) and these black walnut – carob dessert bars. I’d love to know how you use carob…especially if you have recipes to share!